GET LEAN, HARD AND SHREDDED ! 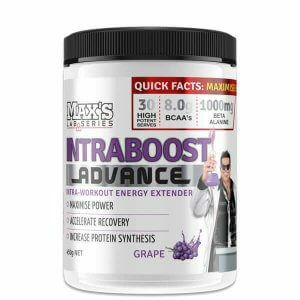 MAX’S SHRED SYSTEM PROTEIN POWDER will help you build lean shredded muscle and burn fat – GUARANTEED ! Getting really shredded requires consistency and discipline. You must train with intensity and continue to push your muscles to their absolute limits and beyond. But developing a lean and impressive physique requires more than just hard training. Diet is the key. Every lean and ripped physique is the result of constant attention to diet. You must plan your total nutrition intake, and stick to your plan.A high protein diet with moderate carbs and fats is the proven and reliable way to get shredded and stay that way. Of course you have to watch your calorie intake, but upping your protein should be the key element of your nutrition. Getting the right amount of protein is often difficult if you are relying on food alone. This is where MAX’S SHRED System is ideal. 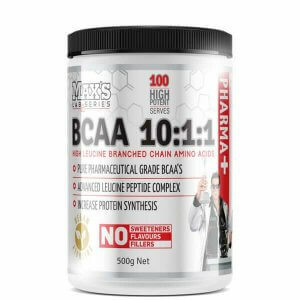 This fantastic high protein formula packs a blend of fast, medium and slow absorbing protein to keep you feeling satisfied for hours while it supplies your muscles with the protein building blocks they need to recover and grow.But it’s not just about protein. 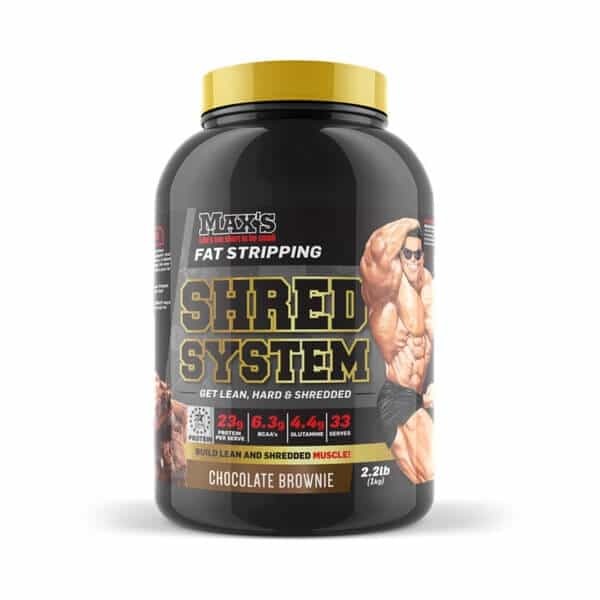 SHRED System also provides potent carb blockers and fat burners to fire up your metabolism so you burn more fat, while your training, throughout your day, and even when you’re resting. It all adds up to a leaner more shredded physique. Blended proteins verses single protein – it’s a hot topic. When your goal is to get lean and shredded, what should you look for? What you need to know is that different proteins have specific characteristic, strengths and weaknesses. Whey is fast acting – ideal for taking after training but not a good choice before bed when you need slow release. In fact science now supports protein blends as the best muscle building option. Quite simply, you get enhanced protein synthesis by taking a blend of fast, medium and slow proteins than by just taking one type of protein alone because you get a longer opportunity for protein synthesis. But there’s another benefits for trainers wanting to get ripped. Slow Release Caseins form a gel in your stomach during digestion, which makes the casein much slower to digest and keeps you feeling fuller for longer – which is ideal when you are watching your calorie intake.This is the thinking behind our MAX’S Anabolic Protein Blend. You get a specific combination of fast, medium and slow dairy proteins to keep you growing longer plus the slower digesting caseins keep you feeling satisfied to make calorie restriction easier. Raspberry Ketones – are organic compounds that give raspberries their colour and flavour. 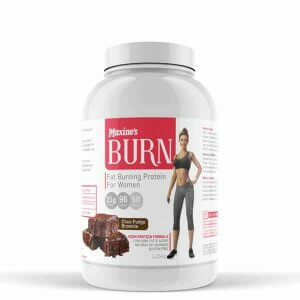 They stimulate fat cells to mobilize stored fat which can then be burned for fuel to get you leaner with more energy. Guarana comes from the seeds of a South American shrub Paullinia Cupana. The primary active compounds in guarana are the alkaloids theobromine and theophylline. These compounds combine to stimulate the central nervous system, increasing your metabolic rate and thermogenesis. Caffeine – research shows that caffeine helps trainers burn twice as many fat calories in the hour after finishing exercise. Caffeine will also improve performance during both short term, high intensity exercise such as weight training and endurance exercise. Garcinia Cambogia – is a small tropical fruit that contains a potent carbohydrate regulating compound – Hydroxy Citric Acid or HCA. It’s main action is to block an enzyme called citrate lyase, which your body uses to convert carbohydrates to fats. Phaseolamin is an extract of white kidney beans that inhibits the action of the starch digesting enzyme Alpha-amylase in your digestive tract. When starches can’t be properly digested in your small intestine, they aren’t absorbed and so pass through you. The key active component of GCA, Chlorogenic Acid, regulates enzymes in your liver that regulate the production of glucose.